Barclays, UK's second largest bank by assets, has been targeted for manipulating the London interbank offered rate (LIBOR) during the time before the financial crisis and through the height of the financial crisis (2005-2009). The bank was fined 290 million pounds or $453.4 million USD. In addition, under public pressure, a number of upper management resigned including Bob Diamond, CEO, Jerry del Missier, COO, and chairman Marcus Agius all resigned within a week of each other. Furthermore, the bank lost an estimated $5B in market capitalization. The British parliament’s Treasury Select Committee is currently involved in this matter. The LIBOR rate is the average interest rate estimated by large volume banks participating in the London wholesale money market. In essence, it is the interest rate at which reputable banks can borrow from other banks. Each bank will submit their rate and the average is the LIBOR rate. From that rate, banks determine what the credit card interest rates, mortgage and loan interest rates, and most anything dealing with interest rates is calculated. An investigation took place over Barclay. Investigators found emails (see below) that there were traders fixing inputs that factored into the calculation of a higher LIBOR rate. Part of Barclay's defense is that they felt they were pressured by the UK government. In one email dated November 22, 2005, a senior trader in New York wrote to a trader in London: "WE HAVE TO GET KICKED OUT OF THE FIXINGS TOMORROW!! We need a 4.17 fix in 1m (low fix) We need a 4.41 fix in 3m (high fix)." 1m and 3m refer to one-month and three-month Libor rates. "Always happy to help, leave it with me, Sir," and "Done ... for you big boy ... " "[Senior Trader] owes me!" reads another. It seems that the rewards were tasty. Champagne was popped, judging from another email: "Dude. I owe you big time! Come over one day after work and I'm opening a bottle of Bollinger." What were the actual rate submissions of Barclays? We can see from the below chart that Barclay's interest rate submissions were higher than those of the Libor rate in red. In grey, we can see rates of other banks. As you can see, there is a high volatility during October. 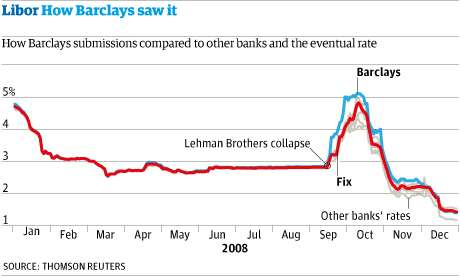 There were a lot of banks below the Libor rate and even some including Barclay above. From an ethical and fraudulent perspective, I have no doubt in my mind that what Barclay has done is unacceptable, unethical, and could be argued as fraud. Evidence suggests that traders knowingly manipulated the inputs of the Libor calculation, which resulted in skewing the Libor rate. They should and will most probably be punished. However, from a financial perspective, a $453M fine is not a big hit to Barclays. This is a multi-billion dollar company. How much did Bank of America lose as a result of acquiring Countrywide? I'd wager a bet to say at least more than a couple billion. As for the Libor rate, it is an average of rates from other banks. Although Barclay's rates were higher than the actual Libor rate, it isn't higher by much (not even close to half a percent). Also, as we can see from the chart above, it looks like other banks could be accused of manipulating the rate as well. In fact, the Royal Bank of Scotland sacked four of their own traders over allegations of a similar event. The long and the short of it is there will be punishment and the market may react negatively in the coming days/weeks as a result, but Barclay could come out of this okay. Disclaimer: This article is written for informational purposes only and isn't intended as investment advice. Disclosure: I am long BCS.